Where do the better recruiters work at: In-house, agency or RPO? Where do the better recruiters work at: in-house, or at service providers in the RPO area? Maybe working in a company, in-house recruiters are better, because they know the company and the best professional managers and hence are able to select the candidates best? Or maybe in an agency, as the recruiters working there know the market or the industry best and are working on a compensation structure with a high variable component which make them very success oriented? Or are even those recruiters the better ones who manage a recruitment process outsourcing services to a company with a highly professional recruitment process and combine both worlds first mentioned ? I'm sure every recruiter has his or own opinion, because he or she once had to do with each other "recruiter species", or perhaps changed from one area to another, or simply working with assumptions about to form an opinion. How do you measure the quality of a recruiter? The quality of a recruiter is determined by various factors. Among others, the experience as a recruiter and the whole professional experience as well as the knowledge of the company's are decisive points. In addition, functional and operational capabilities and business-related skills are of crucial importance. Evaluation "Where do the better recruiter"
Due to the large interest in this matter and the extensive participation in the survey to date, a total of more than 270 responses from recruiters could be included. 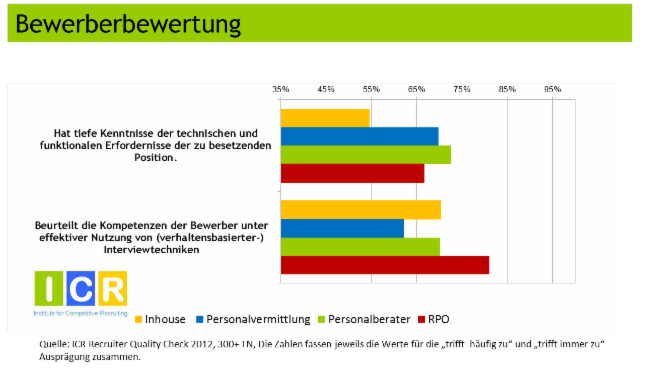 54 will be drawn from the in-house recruiting, 91 from external recruiters, recruitment consultants and even 99 out of 29 from the emerging field (in Germany) of RPO. The evaluation should take place in different parts to allow sufficient time to discuss the separate results. In the first part of the experience will be considered the recruiter about the various activities. In the second part, the functional skills will be the focus, then the third part is a comparison of business-relevant skills. Finally, the three components will then be weighted and ranked and should identify where the better recruiter work at. The quality of a recruiter, and thus his or her success is highly correlated with the total including previous work experience, as well as a recruiter with experience and expertise at this company. In-house recruiters and recruiters in the recruitment to have a 1.5 to 2 times as high proportion of those with 3-5 years experience in executive search and RPO in the area. 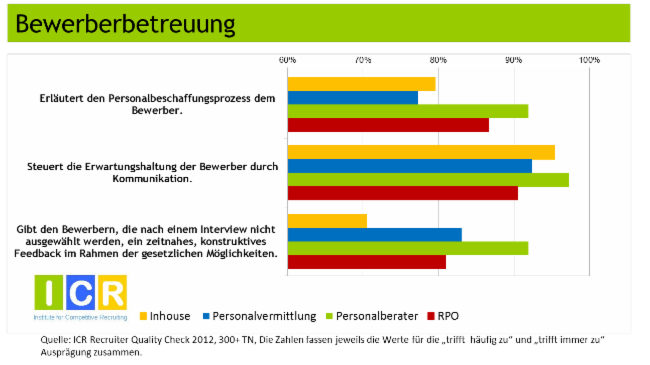 In the segment 6-10 years of professional experience, the picture is mixed: Here are the RPO area and the activities in-house recruiting well before the executive search and placement. RPO in the area do not work with recruiters under one year of professional experience. An activity in the RPO area is therefore not possible without previous recruitment experience. In the segment of Recruiters with 3-5 years of professional experience, the in-house recruiting partly an almost twice as much (1.5 times RPO) has, like all other fields of activity. In the segment 6-10 years of professional experience, the picture is mixed: here the RPO field and lead the work in-house recruiting the list just ahead of the executive search and placement. In the second part of the evaluation, we will learn something about the differing quality of recruiters through the comparison of functional skills. Due to the large interest in these issues and the further increased interest shown currently total more than 300 responses from recruiters could be taken into account. 64 will be drawn from the in-house recruiting, 99 from external recruiters, 112 personnel and 29 consultants from the fledgling area of the RPO. When comparing the different areas of expertise offered each indicative descriptions, the recruiter then for himself with five forms of "strongly disagree" to "always true" provided. The graphics were the details of the recruiter with the expressions "often true" and "always true" combined. In the field of competence, it is first order assumption that overall very little is being worked with agreements that help to clarify roles and responsibilities and to control the hiring process can be used. The recruiter in RPO area still lead the field with just under 50%, the recruiters in the recruitment and in-house does not even come to 40%. More significant is that recruiters at RPO and executive search consultants more often than the other two start with a detailed analysis of requirements during a vacancy in order to understand the specifications of the position and bring expectations into line with reality. Otherwise, still surprised that not have the assumed in-house recruiters, the best knowledge of the supported business units, but the recruiters from the RPO area. The winner of this field of expertise is clearly the recruiter in RPO area. When considering the field of expertise proactivity is a striking discrepancy between the three areas of activity for recruiters recruitment, consulting, RPO and those in-house field. The former are much more proactive, more often maintain contact with passive candidates or seeking to build on these contacts or anticipate developments in the recruitment. The distances are sometimes 40-50%! Overall, this field of competence is relatively unique to the area recruiters working in RPO. 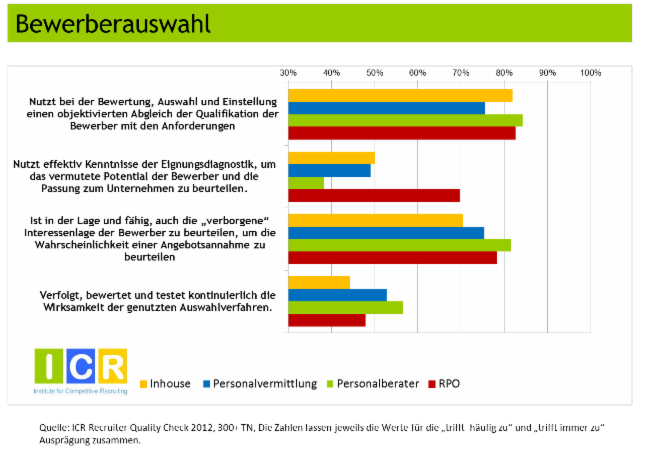 Qualititäten in search of candidates showing increased recruitment agencies and recruiters in the RPO area. 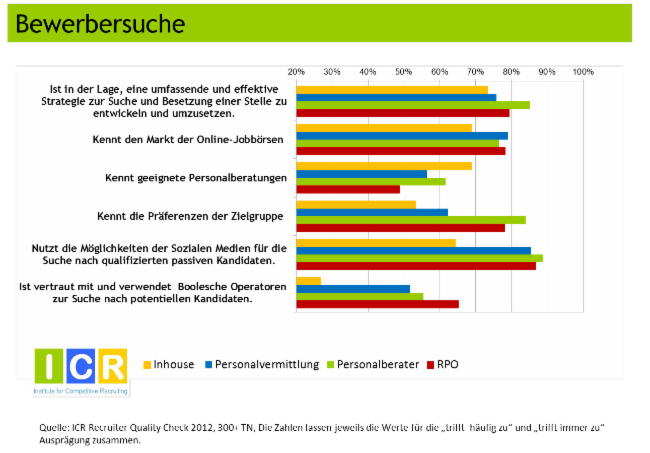 You know better than others, the preferences of the target groups, more frequent use of social media like Twitter and LinkedIn for the candidate search and even dominate almost three times as common as in-house recruiters to search for hard to find candidates in the search engines using specific search strings and Boolean ' between operators. The in-house recruiters can only score with the knowledge of appropriate recruitment agencies, but this is not so relevant in this comparison, since the other even for the most part these are very personal service. Provide expertise in this field in the active area of RPO recruiters head-to-head races with those in the executive search. Knowledge, skills and abilities that are required in determining which fit candidates on the one hand most of the vacant position and the company and let the other suspect is a high probability, in the company to be successful and an offer also should take the all recruiters be highly pronounced. 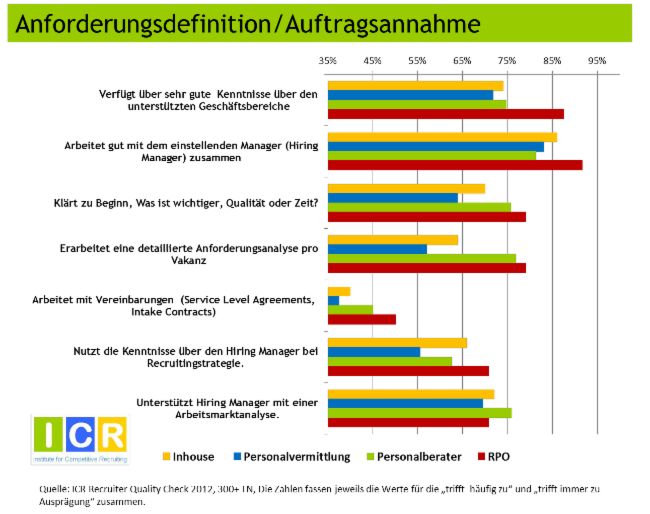 In comparison to notice that the undersigned, being fit and proper diagnosis is most likely used by the RPO recruiters and mastered, this surprisingly almost twice as often as the recruiters in the executive search and nevertheless still close to 1.5 as often as in other fields of activity for recruiters . Judging the "hidden interests of an applicant, the recruiter confidence in the executive search with a slight distance to most, they also optimize the effectiveness of the most commonly used selection. 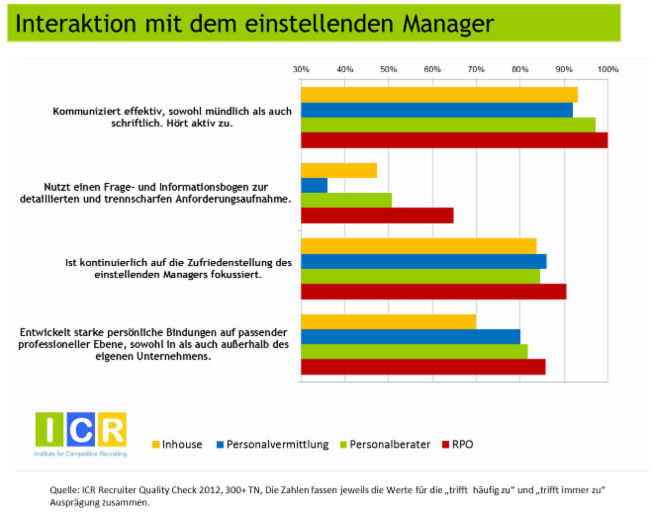 In the field of competence in the candidate selection can make Recruiter RPO area because of the special knowledge of the S Pitzen Eingungsdiagnostik just save space in front of the recruiter in Personalberat ments. Although the in-house recruiters are colleagues of the hiring manager and even a few years in recruiting in the respective companies, you can not claim to have the deepest knowledge of the technical and functional requirements of the vacant position. This claim with a distance of some 50% of the recruiters in the other three areas of operation. The highest use of effective interview techniques hold by far the recruiters in the area of RPO can be secure and thus also the first in this field of expertise. For the most effective use of applicant tracking systems are the staffing agencies and recruiters in the area about the same on RPO. The recruitment process is a total of recruiters in all four fields of application in about equally well managed. Overall, the recruiters are here in the executive search firms just beginning. Candidates seem to be best looked at recruitment consultants. You explain to candidates the recruitment process most often control the expectations of the candidates by communicating the next steps and the frequency of the notifications even slightly higher than the in-house recruiters and, following an interview, almost all non-selected applicants more timely constructive feedback. This practice area is clearly on the recruiter, executive search firms. Applicants must be in times of labor shortages not only found and selected, but also convinced that they remain in the final phase of the recruitment process and on the ball and actually start the company. Who delivers the best performance in this discipline? To develop a compelling, differentiating employer attractiveness statement and use to attract selected candidates for difficult to fill vacancies, not the corporate recruiters seem best able to, but outside, perhaps, however, in the company (onsite) working Recruiters from RPO area! With the ability to the company, based on good or very good knowledge of the history of the company, its financial data, market position, etc., to sell well, back to corporate recruiters are just the beginning. The best support for the candidate with a detailed overview of the offered challenge, the department and the city and the region offer the recruiter, executive search firms. 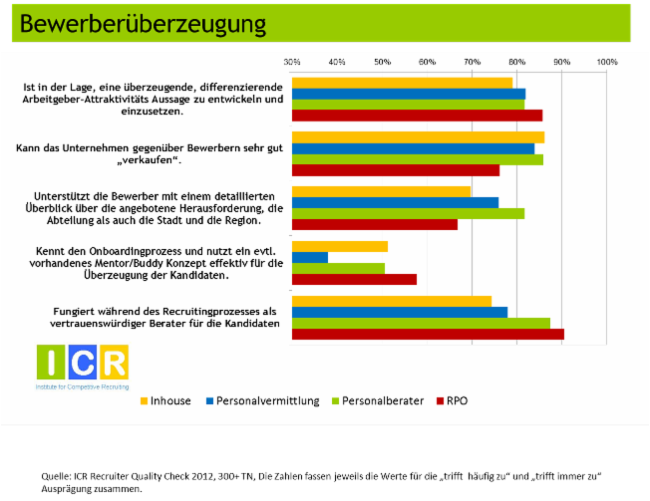 Knowledge of the Onboardingprozess for the conviction of a candidate to use the RPO Recruiter at best. Act as a trusted advisor during the recruiting process, the recruiter from the RPO area. The RPO recruiters need to be in this field of expertise but i just nsgesamt beaten in the recruiters headhunter. When considering the interaction with the hiring manager to get married Recruiters from all four activities, to communicate effectively. When using a questionnaire and information sheet for detailed and selective sharp requirements capture, which also includes the mutual responsibilities and timetables to increase the quality of the recruiting process and reduce the time required, separate but quickly the chaff from wheat: In RPO recruiters almost twice so frequently in use as recruiters in the recruitment, they also lead ahead of the other two by far. Among the indications of the satisfaction of the recruiting manager and the development of personal relationships on a professional level, the differences are not significant. Since the recruiters from the RPO perform well here, victory is in this practice area also to them. 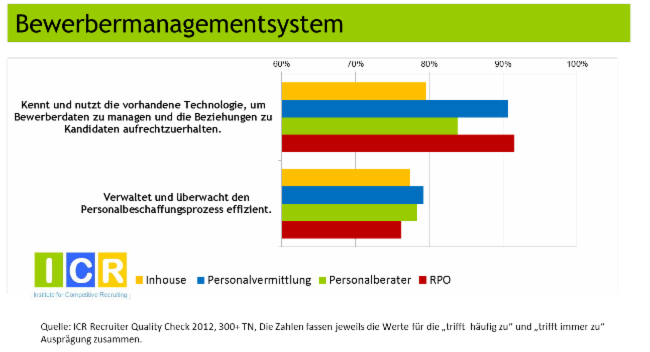 The consideration of the differences in the nine functional Kompentenzfeldern basis of detailed indications and their expressions can be profound insight and with the participation of over 300 recruiters and empirical broad-based statements. A tabular summary of cutting the recruiter out of the four activities you can see from the table above. Overall, the recruiter from the RPO area, ranking in the functional skills can by its own account in the respective indications just decide for themselves. In second place followed by the recruiters of executive search firms facing the recruitment and permanent recruiters in companies.